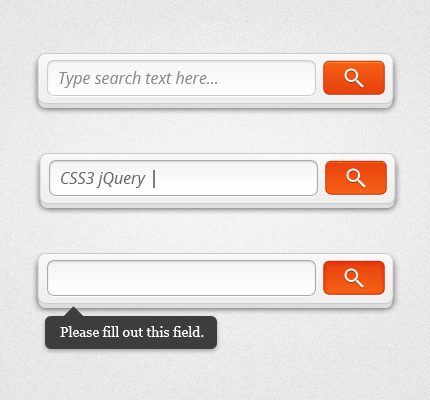 Free CSS3 HTML5 jQuery Search Forms. – A visitor’s guide for content. A search box is one of the most frequently used in the websites . To make your website more user friendly, a search box does the function of searching the content for the user. Add a stylish search form. This will not only help searching contents easily but also make your website appear modern and professional . Check our collection of best free CSS3 HTML5 jQuery Search Forms. A simple, centered form with a pulsing glow effect on the input during focus. This shows the search icon on the website. When you click the icon the search bar opens and enter your required search text . In this tutorial we are using Google’s AJAX Search API, to create a custom search engine, with which you can search for web results, images, video and news items on your site. This search form is designed in CSS3 and has a simple jQuery validation with a popup appearing if the user doesn’t fill out the search field. 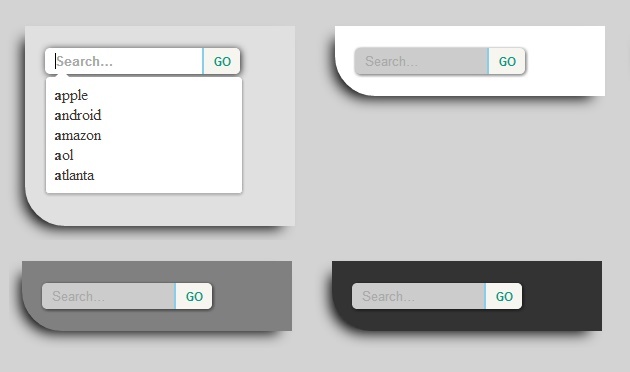 This is an Apple inspired CSS3 search box. The search field expands slowly when focused/clicked. This animation effect achieved purely using CSS3 transition property. This is a cool and usable CSS3 search box using the HTML5 placeholder attribute. For the browsers that don’t support this new HTML5 attribute, a fallback is created using Modernizr’s feature detection. This is a simple search box using HTML5 placeholder attribute and styling it with CSS to give a realistic shadow effects. 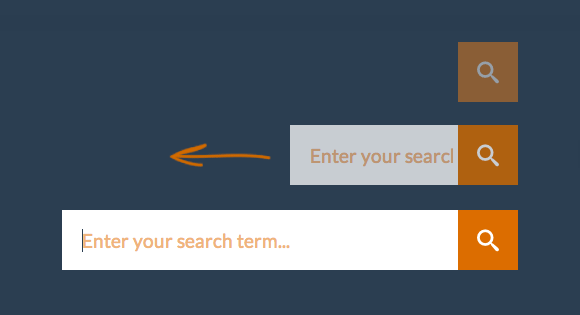 One of the things we thought might be nice to change is the search input. We’ve put it from the sidebar into the header and we use a common effect where you have to click to expand the input. We have received many requests on explaining how we did it and today we’d like to show you how to create a search input like that from scratch. The aim is to maximize compatibility for mobile devices and older browsers (down to IE8). Although this might seem like a super-easy thing, we’ll have to apply some tricks in order to make it work properly. This is a simple suggestion box made with pure CSS. 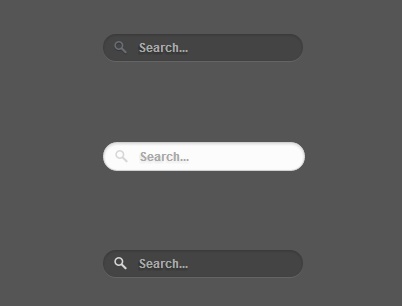 Full Width Search Bar by Luke Desroches. This is achieved using fluid widths of the input type="text". When we use the widths in percentage, the element is then get the widthadjusted according to the current window’s widthand that is what happening here. You can take a look at the full view and resize the code block to watch it change it’s width according to the available space. 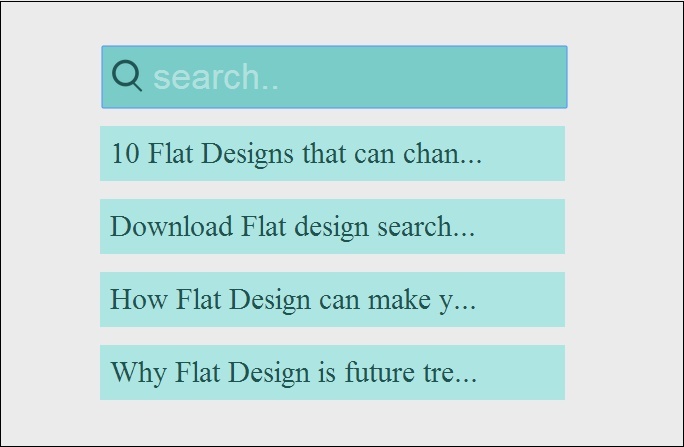 A flexible search input with an internal fixed-width submit button and fixed-width border.